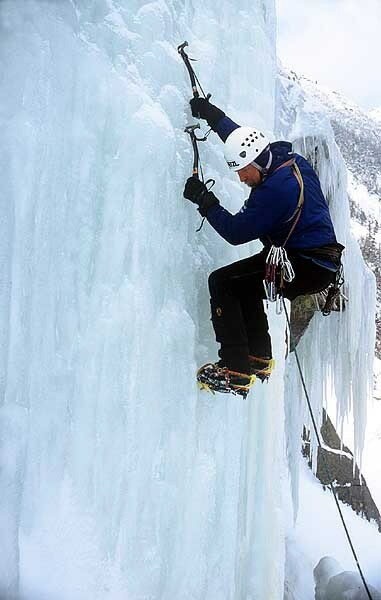 I started climbing in 1975 at age 21 with a very exciting Ice Climbing lesson taught by International Mountain Climbing School guides. 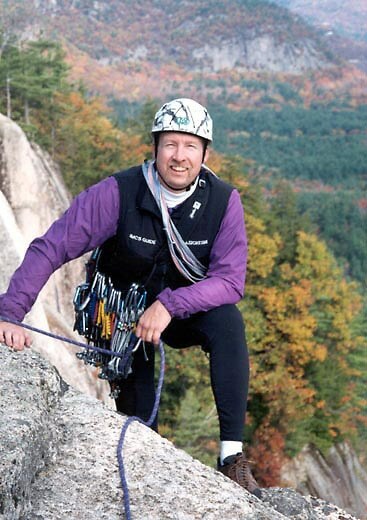 I followed up with a number of rock climbing lessons that summer and was guidebook author and guide Ed Webster’s first client for IMCS. I continued to climb and soon made my first international trip in 1981 to Peru. We climbed a very early ascent of the West Face of Tocllaraju 19,000’ and the SW ridge of Chopicalqui (21,000’). The experience in Peru only intensified my desire to climb and I started creating new climbs here in New Hampshire, New England and around the country. Another major personal goal was accomplished with an ascent of El Capitan in Yosemite in the mid eighties. Another trip to Peru in 1987 enabled me to climb the classic SW Face of Alpamayo and the N. Face of Ranrapalca. I was offered the chance to guide for IMCS in 1991 and ended up jumping in with both feet. The down time during off seasons gave me the chance to explore the White Mountains even more than before and along with many first ascents of both ice and rock routes I was able to make ski descent’s of a number of gullies in Huntington Ravine such as O’Dell’s, Central, Yale and other areas. Mixed in this time frame were trips to climb Mt. Blanc, the Frendo Spur and a number of ski descents all in the French Alps and rock climbing trips to places such as Joshua Tree, Red Rocks, Yosemite, New River Gorge, Utah Canyonlands (Castleton Tower), Tetons ( Grand Teton), Owens River Gorge and the East side of the Sierra. I started guiding major peaks as an assistant guide for a Mountain Trip/ IMCS combined successful ascent of Denali in 1993. I guided ascents on both major summits in Peru, Huascaran Note in 1995 with fellow IMCS owner and Everest summiteer Rick Wilcox and Huascaran Sur in 1997. In 1996 with both future climbing school partners Maury McKinney and Rick Wilcox we made an early season attempt on the 13th highest peak in the world, Gasherbrum 2 in Pakistan. We were turned back at a little over 24,500 feet on summit day by a large storm but were proud of our personal effort of being the only team on the mountain at that time. The demands of family had started to take more and more of my available time in these last ten years but I was able to still travel to Nepal and climb and Ski the highest trekking peak in Nepal, Mera Peak (21,000’) in 2001, do a big wall ascent on Half Dome with fellow guide Paul Cormier, and a major big wall on El-Capitan called Mescalito in seven days with fellow guide Jamal lee-Elkin in 2003. In 1997 I had become VP/Head Guide and a partner in International Mountain climbing School and started doing more and more office time and administrative work. In both 2006 and 2007 I was able to make climbing trips to places such as Arizona and the Tetons. In spring 2006 with long time client Ken Grinnell I guided an amazing desert rock peak called Baboquivari which is located south of Tucson. Also in 2006 I climbed the Grand Teton again, this time with my sixteen year old son, Ian. This was a very rewarding experience being able to share the mountains with members my family. In the last few years Rick Wilcox and I now co-own the school and I am now both the president and director of IMCS. My job now more than ever is to try and assure that your experience with IMCS is the best we can provide, either with me as your guide or one of our other excellent guides taking you out for a day of climbing or a month in a remote range. (2011) Brad White has a wonderful wife Barbara and two beautiful children Ian (20) and Lauren (16) and lives in North Conway NH. Ian is the starting right guard for the Boston College Eagles football team. Go BC!